Dr. Paul Boaheng, Associate Professor of Philosophy in the Department of Government and History at Fayetteville State University (FSU), has been named a recipient of the 2019 University of North Carolina Board of Governors Award for Excellence in Teaching. The UNC Board of Governors selects 17 outstanding University faculty members to receive the award. The recipients, who represent all 16 of North Carolina's public universities and the North Carolina School of Science and Mathematics, are nominated by special committees at each institution and selected by the Board of Governors Committee on Educational Planning, Policies, and Programs. This year marks the 25th anniversary of this prestigious award. Established by the Board in 1993 to highlight the importance of teaching, the award recognizes the extraordinary contributions of faculty members System wide. 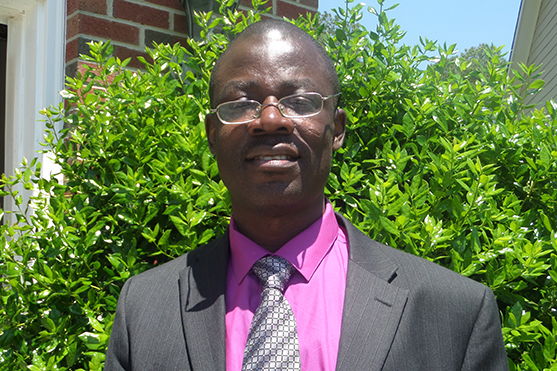 Boaheng has been teaching at FSU for nine years. During his tenure, he has won numerous teaching awards including the 2017-2018 FSU Teacher of the Year, 2015-2016 College of Arts and Sciences Teacher of the Year Award, as well as the 2017 Outstanding Online Course Design Award. These competitive awards recognize creativity in pedagogy. In 2016, he supported FSU's Quality Enhancement Plan by becoming a Charles Chesnutt Library Fellow. In this capacity, he successfully redesigned his Critical Thinking classes to meet the Association of College and Resource Libraries (ACRL) competency standards. Boaheng has been involved in the designing and teaching of Global Understanding (GU) courses as part of FSU's educational partnership with China. He was selected to receive a Global Understanding (GU) Travel Award funded by Title III to travel to China to work with Chinese professors in designing a GU course on world religions. Since that time, he has successfully taught this class as a GU course with Baotou Teachers' College in China and Inner Mongolia Normal University, also in China, using interactive videoconferencing and other Internet-based technologies. The GU courses have played a key role in facilitating FSU's primary mission to produce global citizens and leaders. In recognition of his excellence in teaching Global Understanding courses, in 2018, Boaheng was awarded a highly competitive China Studies Institute (CSI) Zhi-Xing China Academic Impact Fellowship by the American Association of State Colleges and Universities (AASCU) and China Education Association for International Exchange (CEAIE). Boaheng received his Bachelor of Arts Degree from the University of Ghana in Legon, a Master of Philosophy Degree from Norwegian University of Science and Technology in Norway, and a Master of Arts Degree from Simon Fraser University in Canada. He received his doctorate from the University of Alberta in Canada.